With its breath-taking sunset views and its delightful island aesthetic, this is the kind of place that will make you want to come back year after year. Villa St. John 2 is located right on Agios Ioannis bay. 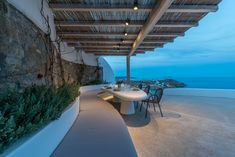 The area is one of Mykonos island’s most beautiful and in-demand locations because of the stunning sunsets, the famous hotels and the sandy beach of the same name. The property has direct access to the waterfront, placing it in a extremely rare category of properties. 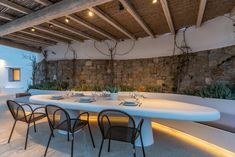 The villa overlooks the mystical island of Delos to the west and is only a short 7 minute car ride from Mykonos town. 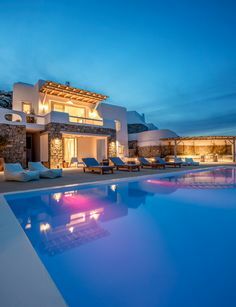 The villa is a short ride away from some of the islands hot spots, such as Scorpios being 7 minutes drive away and Nammos being 10 minutes drive away. Alternatively you could visit the beautiful St. John beach which is a 2 minute drive away. The house exists in group of 8 houses and boasts an area of more than 10.000 sq.m. of private land. The villa sleeps 8 people and consists of 4 bedrooms, 3 with en-suite bathrooms, 4th bathroom and WC, living room, dining room, open-plan kitchen, 2nd kitchenette and many spacious verandas and outdoor seating areas. All rooms have gorgeous sea views which will leave you breathless. The living room has a dining room table which seats 8 people and the spacious outdoor area has a dining area which seats 12. Panoramic views can be enjoyed from 2 shaded outdoor relaxing areas. The open-plan kitchen is directly accessed from the living room as well as the wide terraces. The master bedroom is situated on the top floor of the villa. This bedroom has an entrance hall, en-suite bathroom and a veranda with a king size double bed under a shaded area. The three bedrooms are located on another floor, all with gorgeous sea views. The bedrooms have a 200 square meter terrace. 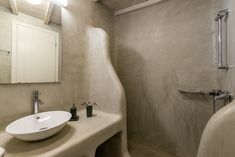 Two of the bedrooms have en-suite bathrooms and one has a separate double basin bathroom. The communal infinity pool is located in the middle of the 8 villas. 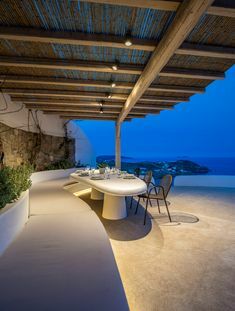 Guests can enjoy a BBQ or make use of the communal bar while enjoying panoramic views of the Aegean sea. The shaded area with luxury sun beds is the ultimate relaxation spot. 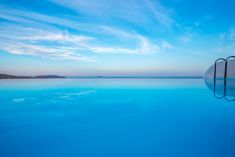 The pool has fresh sea water circulation and is continuously filtered.